The DMM Aero Quickdraw set is a pack of your modern day sport/trad crossover quickdraws: innovative, strong, reliable, with a few small additions that you'll be more than grateful for in high-pressure clip-or-fall situations. Both the Bent and Straight 'biners of the Aero Quickdraw have been designed to be easy to handle, easy to clip onto the bolt and rope ends, with a hot-forged and fully anodised aluminium alloy body that promotes longevity whilst only weighing a super light 47g each. Annoying inconveniences - like misclipping or fumbling with 'biners - are small problems that soon become big ones when every second counts. These quickdraws aim to put a stop to these, so you can climb at your best. When you’re pumped, those few milliseconds of missing or fumbling with clips can feel like an eternity. DMM have taken the bent gate from the Alpha Clip that uses a flared-out barrel shape to promote smooth and effortless clipping of the rope, first time. (A generous 24mm opening also allows for clean clipping of all rope sizes.) Work with the clip, not against it. No climber wants to hear the word “drop”, or the familiar sound of the “chink” as the clip bangs against the bolt. Both ‘biners have an ergonomic shape for easy and natural handling, while the Straight now has better placed grooves for maximum grip and ease of opening with an angle that works perfectly with the bolt opening. Handle with care, and these ‘biners will take care of you. On the Aero Straight this makes for clean clipping and unclipping on and off the bolt, on the Aero Bent it prevents the rope from snagging. Hot-forged from a fully anodised aluminium alloy, the Aeros are exceptionally tough and durable, with a weight of only 47g each. This also means that the Straight is much less susceptible to damage from the bolt hanger, protecting the longevity of your gear. A well-rounded radius on the Bent is also kinder to ropes, prolonging their life. Uses rubber retainers to help keep the ‘biners loaded correctly at all times for reassurance of a safe anchor. ‘Biners nowadays aren’t all about size and shape. 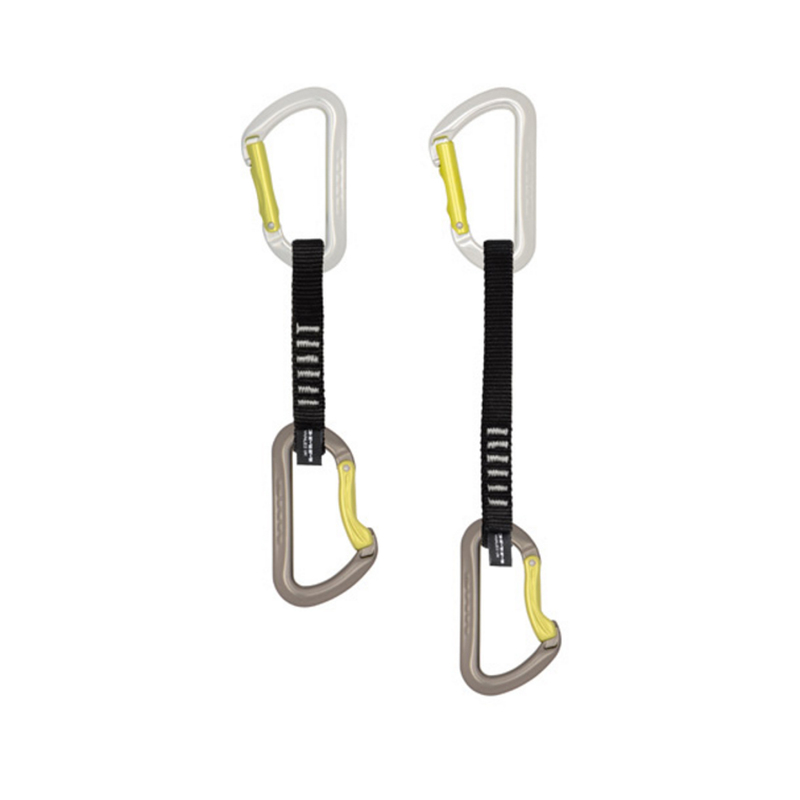 With the level of modern climbing, ‘biners need to do everything they can to promote safety and security. The top-bar angle of both the Aeros has been chosen specifically to promote correct loading onto the back bar and away from the gate, whilst a positive gate tension keeps the gate shut avoiding gate flutter or harmonics in heavy falls. Specifically on the Bent, careful shaping ensures the rope sits correctly in the ‘biner, while and clever contours of the gate resist accidental unclipping to increase your safety. You wouldn’t climb with an untrustworthy partner, so why do the same with you gear? Size is perfect for sport but without too much drag for trad crossovers. Great engineering, with a top quality finish. The gate mechanism is very smooth, and fluid in use. Not the lightest product on the market, but a great mid range alternative to the more expensive models.